Norway is still in shock, but it is a shock that softens and hardens its people at the same time. Softens when it comes to feelings for the people that have been hit by this terrible massacres, and towards each other - hardens when it comes to the determination that the destructive will of the evil people behind these occurrences shall not prevail. Currently 93 people are known to have been killed. Most of them were youngsters between the ages of 14 and 20, members of the Labour Party's Youth Organization. The party's symbol is the Red Rose. I offer this little rose as a small token of my support to all those who have been killed, wounded or have lost someone dear to them. Beautiful photo and sentiment, Rune. What a poignant rose that is. You have lost the flowers of your Norwegian youth - the future leaders of a democratic society. My heart goes out to their families and the people of your beautiful country. Sanne ord Rune, og vakker rose. A sad ,but beautyful and strong tribute..
Too many mad people in the world, we've seen too many of them in London and Northern Ireland. You'll get through it as we did, but it does change the way you see the world. 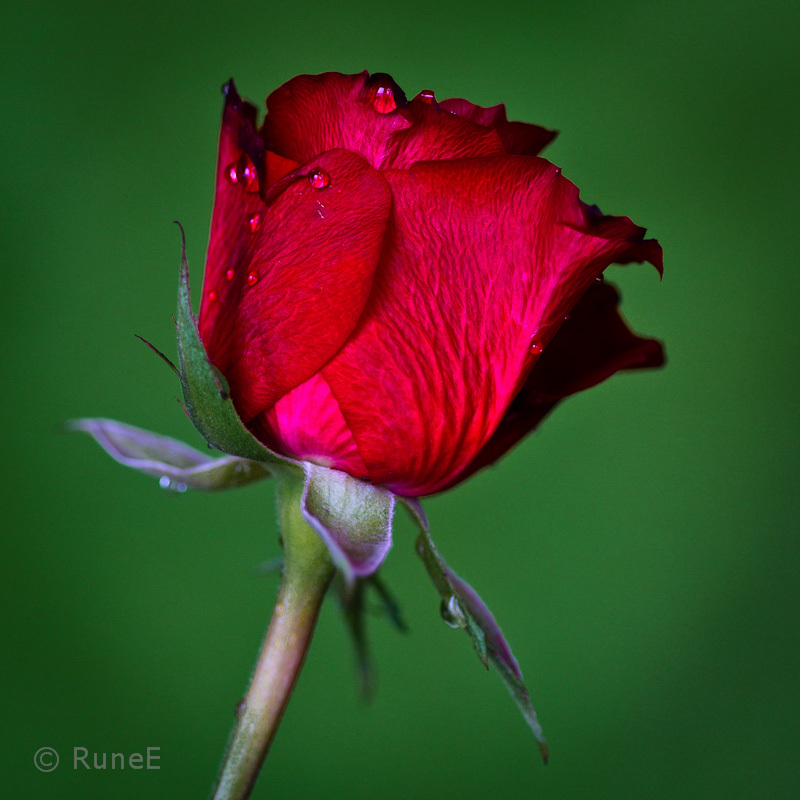 Dear Rune, your red rose and your poignant words bring tears. Many around the world are shocked and saddened by what happened, and I am one of them. It is very, very sad, and those who lost loved ones weigh heavily on our hearts. They are in my thoughts and prayers, as is your beautiful country. May goodness and love bring strength and healing. I'm so sorry that Norway is experiencing so much grief today. I was totally shocked when I heard the news. Of all the countries in the world, Norway is usually one of the most peaceful. It should be a wake-up call to everyone worldwide that no one is immune. Vakkert og symbolsk Rune. Føler meg fortsatt litt i limbo, skal derfor reise hjem til Oslo om et par dager. Føler jeg må hjem for å legge ned blomster, delta. Vondt å være et annet sted enn der jeg vil være. Når jeg har det slik, er det nesten umulig å forstå hvordan de har det de som er offere i denne forferdelig hendelsen. Men som du sier: dette skal vi overvinne! Nydelig rose og viktige ord! My thoughts are now with these people who have died in Norway, their families and all the whole country. I don´t understand how a human mind is able to do things like this. All Europe is concerned by this news that are comming from this beautiful Scandinavian country. Rest in peace those who died in this tragic murder and a lot of courage to move forward the democracy to all the other Norwegian people. Well said, Rune. Maybe it's some comfort to know you live in a place where this is even more of an aberration than it would be in other parts of the world. What a beautiful image and sentiment. I, like everyone else am just so shocked at the tragedy. It's so hard to imagine what could ever make someone do this. I am so sorry and send my condolences to your beautiful country. Stay strong and know that we care. To all those who have commented and made condolences on my blog these last few days: That you very much! It is highly appreciated. Et fint innlegg.I all elendigheten er jeg stolt over å være norsk. As an American I would hope for the death penalty for this less human murderer. So senseless. Beautiful tribute ... esp. love the water drops ... just like tears in the face of such a tragedy. I join up with you for the grief of Norway . I like very much your country where I was last year. Your country and your people have been in my thoughts and prayers, Rune! I feel such grief for those who have lost love ones and for your entire country! My heart goes out to all of you! Your country will survive!